Seven flights got completed today in perfect conditions. Unbeaten, Cameron Appleton and his Team Aqua lead the contest ahead of Ceeref (Rod Davis) and five teams on a tie in third. Sailing for the first time in Northern Europe, the RC 44 Class benefited from great sailing conditions today. Seven match race flights got completed in winds ranging from 8 to 18 knots. 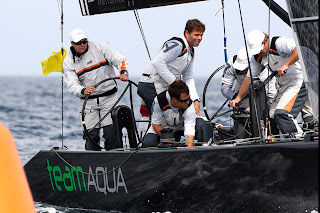 Photo: Copyright Per Heegaard / RC 44 Class : The winner of the day, Team Aqua, with Cameron Appleton at the helm. The winner of the day is Team Aqua, unbeaten after six matches and sailing very consistently throughout the day. Cameron Appleton’s day started with a tough match against the America’s Cup winner James Spithill, sailing on a boat called 17. There was no such thing as an observation round: the pre-start was very intense, and led to a premature start by Spithill that allowed Team Aqua to win a fairly easy point. The team from the UAE then aligned the victories with great confidence, finishing the day unbeaten and without being seriously threatened. The Slovenian team Ceeref, with Rod Davis at the helm, also had a smooth ride, winning its first four matches of the day and only loosing to James Spithill’s 17 in the last flight of the day. Five teams are on a tie in third: Team Sea Dubai, No Way Back, Artemis, BMW ORACLE Racing and 17. The weather forecast for the coming days is variable, with some rain forecast tomorrow and a slight improvement in the coming days. As for the wind, it is usually not an issue here. Not surprising in a country that produces 20% of its energy through windmills!